High-mount steering head complements the raked-out front end. Long, slim 3.4 gal. seamless fuel tank mounts high on the frame for a true custom look. Slim radiator is mounted unobtrusively to accent the Fury's clean lines. Minimalist front and rear fenders complement the Fury's chopper styling. Control lines and cables are specially routed for a clean, custom look. Rear suspension system gives a clean, uncluttered appearance. Single rear shock with adjustable rebound damping and five-position preload adjustment features an advanced internal valve system for a comfortable ride, and provides 3.7 in. of wheel travel. Large-diameter 45 mm extended fork provides 4.0 in. of plush, responsive travel. Integrated handlebar-mounted chrome housing features a speedometer, odometer / A&B trip meters, and indicator lights for the turn signals, high beam, neutral, oil pressure, coolant temperature, and clock. Electric speedometer with easy-to-read numerals uses an electronic transmission speed sensor, which eliminates the front-wheel-mounted speedometer cable. This contributes to a clean, uncluttered look. 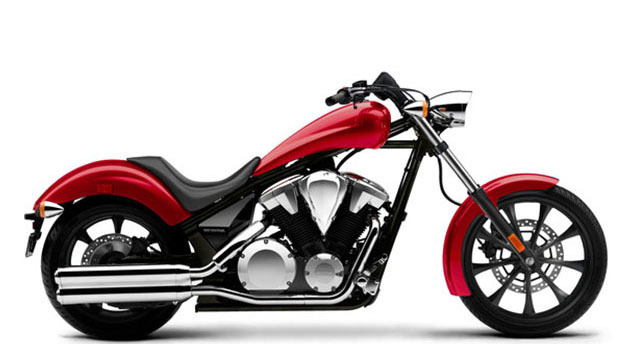 The 1,312 cc liquid-cooled 52-degree V-twin delivers strong low-end and midrange torque, with ample power for passing and relaxed cruising. Unique dual-exhaust system offers throaty exhaust note. Power plant features a single-pin crankshaft to accentuate engine character. Programmed Fuel Injection (PGM-FI) incorporates a single 38 mm diameter throttle body. Five-speed transmission for exciting roll-on performance. Low-maintenance slim-profile driveshaft provides smooth operation with no need for chain or belt guards and covers.